UPDATE: This is now live on all Stack Exchange sites. You can access it at /help or by clicking the "help" link in the top nav or footer of any page. We can all agree that Stack Exchange is a complicated beast that takes a while to understand. New users can be overwhelmed and confused by all of the rules, where to find them, and how to abide by them. Even though many established users leave comments linking to helpful resources, or answer questions posted to metas, it's a scattershot way to help users learn our rules and answer their questions. And so, we're introducing a new Help Center, which you can now see here on MSO: https://meta.stackoverflow.com/help. Consolidate important information that is currently scattered throughout a great many resources: MSO and child metas' faq lists, each site's official FAQ page, blog posts, and miscellaneous other resources like our "contact us"/account help pages and "How to Ask" / "How to Answer" guides. Any rules or explanations of basic site mechanics should be easily accessible in one place. Allow easy linking and easy navigation. Each topic is separated out onto its own page, with a unique URL to allow pointed linking to that page. Each article page also has sidebar navigation that shows other topics in the same category, as well as a list of other categories, for the rare user who is motivated to read more. Use comprehensible language that non-power users will be able to understand. A lot of our guidance, written by the community and by Stack Exchange itself, uses jargon that can be unclear to users learning our system for the first time. We want to make sure terminology is sufficiently explained and use plain language wherever possible. This Help Center will (once we roll it out to all sites) replace the current FAQ pages. Each site will continue to have its own faq tag on meta, but any policy that is essential to the functioning of the community will be rolled into the appropriate section of the new Help Center. What's broken, and what are we missing? We're already planning to add more features and articles to the Help Center in the coming weeks, but we wanted to show you all the core of it and get your feedback. There are additional articles that we plan to include here (especially in the "Reputation & Privileges" category), but the articles currently included should cover everything that exists in the current FAQ and old /help page /contact page (which will be redesigned when the new Help Center is live everywhere). This is live only on MSO right now. We want to get your opinions about the Help Center in general, fix any bugs or typos you might find, and add any crucial information that's missing. Once we've addressed all those things, the new Help Center will roll out network-wide. We will be adding a "search" feature to the /help landing page that will make it easier for users with a specific problem to find the relevant article(s). Site moderators will be able to edit the "What topics can I ask about here?" page to include lists of what is on- and off-topic for each site, just as they can currently edit the "What can I ask here?" part of the current FAQ. So there you have it. A new, consolidated, Help Center to provide a single resource for users looking to understand how our network works. We're still making some small changes to this feature. Please continue to post here on meta if you encounter any bugs / typos / broken links. If you want to suggest a new page, have an issue specific to one site, or have another major change, you can start a new meta post and tag it help-center. The "Badges" view more is exactly the same as the only item listed under "badges", same with "Privileges". The View More could just be removed. Also in the "asking" list IMO "disagree with closure" should be moved down below the items about actually answering questions; newbies probably don't know what "disagreeing with closure" means, I'd keep the brand-new user stuff on top since (presumably) that's who's most likely to look over this (not counting people looking over this to link other people to it). Maybe "how do I delete" should be shown on the front page? I see requests for that more often than requests to add/remove credentials, but for all I know SE gets more emails about credentials than deletion. Problematically they're also two of the first items on the list so it's pretty easy to end up on the dead ends. I'd either move them more toward the bottom or make them link to special pages which show the same info but keep the consistent nav, or at least differentiate Badges/Privs since it's fairly surprising to click on them and find yourself clearly not on a help center page (they're already denoted as "lists" I guess but it's still a bit weird). Ideally if I wanted to say "hey, excessive self promotion isn't okay here, see this" I should be able to go to the help center and copy out a link directly to that subheading, and when you click that link the relevant portion is highlighted in some way. For example with this link the final section on self-promotion really should be highlighted somehow. IN the old FAQ the linked bit was given a yellow background or something to make it stand out, that would work fine. Will the Badges, Privileges and Reputation and Privileges sections be consolidated? It seems silly to have two "Privileges" sections when one could just be a "list of all privileges" link under "rep and privs". But then Badges would get lonely so it should probably be edged in somewhere too (IMO it fits well enough along side rep and privs as it's a third part of the gamification thing). This is a bit touchy-feely but perhaps What's reputation could point out explicitly that downvotes "hurt" rep less than upvotes because we're focused on curating good content moreso than "punishing" bad content? I think it's an important part of the philosophy and it can help people to understand that downvotes aren't quite as big a deal. Sidenotes: the link to https://ux.stackexchange.com/helpcenter/bounties is broken, it's referred to in What's Reputation but it goes to a 404. 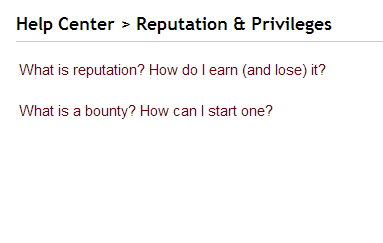 Should probably be https://ux.stackexchange.com/helpcenter/bounty instead, which works. The link to http://blog.stackoverflow.com/2011/09/bounty-reasons-and-post-notices/ in the Bounties page is pretty startling; different website, URL, layout and format. Maybe link that to a Meta.SO FAQ page or include it on the page itself? There's also some other jarring transitions like going to the How To Ask page, but the blog link is the most significant one I've found. I'm sure you are on some level aware of this, but in the spirit of your item (3) Use comprehensible language, please also try to place yourself in the shoes of someone who speaks only rudimentary English. and the use of phrases like "navel gazing". Neither of these seem like they are particularly geared towards "using comprehensible language" if your English skills are pretty basic. It is now far too difficult to find the information about what is on-topic on a site. I knew exactly the content I was looking for and it took me over five minutes to find it as an experienced Stack Exchange user. There is no way we can reasonably expect a new user to find what is on-topic without having to have it linked to them when they post something that is off-topic. This is not user friendly and the on-topic section should be highlighted more directly in either the About/Tour page or in the main "Here's How It Works" graphic. What is on-topic is core to the essence of each site and should be the first thing presented to a user when they are looking for more information on the site and what its purpose is. The two main activites on this site are Asking and Answering. 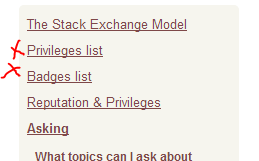 The The Stack Exchange Model column should switch places with the Asking column. The first thing you see when you come up right now is stuff about how to edits posts or searching through the site which is important but only when you know the topic of the site. I'm sure there a more asking than answering new users so the order would make more sense. I think there needs to be a site-specific moderator-editable preamble. There used to be such in the old FAQ, and it contained a lot of valuable information. Moreover, it can be updated, if the community deems it appropriate. With respect to the smaller sites, it is possible for the communities to be more nimble than the SE team (with no offense intended). I see it now, listed under "What topics can I ask about here? ", but it's hardly prominent. I think it would be best if there were an editable section at the top, between "Take the tour" and "Find out more about...", that wasn't behind a link. This would make it more salient for new users and address the non-linear navigation issues associated with the new design. This may not be a big issue but I find the sidebar rather hard to read from and navigate. It looks too homogeneous. There should be some differentiation between questions and topics. Maybe the underlining could be removed from questions. Alternatively, some form of colour coding for topics could be used (not just here, but throughout the help center). for those of us who spell 'Centre' the correct alternative way around? Reading through the entries, it's quite detailed and informative. It will definitely be more useful than the old FAQ for quickly linking to in a comment. Visibility: It's harder to get to. "faq" is something people are used to, and expect to find somewhere near the top. I personally look for it in the topbar and read it on any site I plan to participate on. It's currently hidden in the footer and in the middle of /about. I guess it makes sense to have one primary page and a reference page, though. Length: The previous FAQ was still short enough for a good read. Now it looks labyrinthian, and chances are that people won't read it at all, even the important bits. We need to emphasize some of the sections (specifically the #ask and #dontask sections of the erstwhile FAQ). I recommend linking to them from the About, since the About seems to be the new introduction page. Backwards compatibility: Some links like #promotion link to the whole subpage, not a section on the page. Extra sections: Some sites have extra sections in the FAQ, which were basically created by adding section headers to the top(editable) FAQ entry. Chemistry had one on notation, but it is now part of the page that is supposed to only list what is on topic. This is rather counterintuitive. The same section on Physics is separate because the FAQ entry was a different post (I don't know how that was set up). 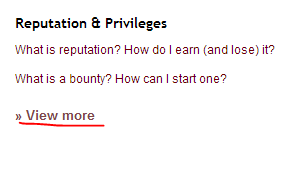 In the past, moderators were told to just use a section header to add to their FAQ (Programmers has done it too). At the time it was a sensible and easy task. Now that the only editable section is /helpcenter/on-topic (which is a separate page), doing this doesn't make much sense. It would be nice if mods could add more pages (at least one) to the help center. The Help Center looks intimidating. I can no longer direct a new user to the FAQ to read about the scope of a specific site because this information is nowhere to be found. It may be worth while to add something like: "How to avoid Getting a question/answer ban" above Why are questions no longer being accepted from my account. "Question/Answer bans: what are they, how to avoid them, and what to do if you get one." While the current version isn't bad, it may be worth while to expand on it, hopefully new users will read it before they need to know why questions/answers are no longer being accepted from their account. This was meant for the main site, no? Perhaps it would be a good idea to encourage users not to answer questions that are blatantly not a good fit for the site with a sort of "What types of questions should I avoid answering?" 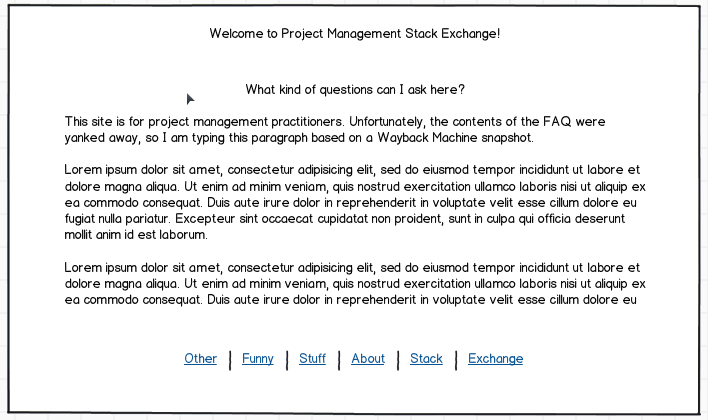 page within the Answering section of the Help Center. When bad questions get good answers it reinforces negative behavior, the user who asked the bad question walks away with a good answer and is encouraged to ask more bad questions, worse still other users see that even terrible questions get answers and the problem spreads. Please note I'm not talking about questions that are just poorly worded I'm talking about the more obvious questions that should be closed/deleted. What types of questions should I avoid answering? Questions that are off-topic, unclear, too broad, or primarily opinion based. Answering questions that are not a good fit for the site simply encourages more questions that don't fit. Rather than answering please consider flagging/voting to close and or downvoting. related: my answer to "Should one downvote answers to off-topic questions?" Your "What topics can I ask about here?" seems like it would be very confusing to a new user. I clicked on it expecting to see it explaining the fact that SE sites have specific topics, and to read the FAQ/about page to find out what the exact topic is for a SE site, and instead see what looks like a page telling you what you should ask the help center about. If we're going to be sending new users to the "help center" for help with the SE network then you might want to clarify that section or title in some way, as I think it would be one of the first links new users click on, and in it's current form does not seem very helpful. The About pages and Tours still have a "Visit the FAQ" link which goes to Help Center. These should be updated to indicate visiting the Help Center. I guess this is more of a question than an answer but it won't fit in a comment. This Help Centre will (once we roll it out to all sites) replace the current FAQ pages. Each site will continue to have its own faq tag on meta, but any policy that is essential to the functioning of the community will be rolled into the appropriate section of the new Help Centre. There are a constant stream of questions on MSO, and I'm sure the other "child" metas, that are duplicates of these questions. If the faq questions are deleted what are the communities on these sites meant to do with duplicates of them? Closing the duplicate without explicitly closing it as a duplicate of a valid question would seem quite harsh to a new meta bunny. As already noted it's possible to edit the current faq questions. How will the divergence of the Help Centre and the meta archives be managed? Locking the meta questions means they get more and more out of date unless they're updated at the same time as the Help Centre, which will require significant additional workload (and for the editor to not forget). Not locking them means that they'll never stay the same. P.S., I know I'm an essentially negative person but I do think this is sorely needed so kudos for getting it done. How does this affect the Analytical badge? I've been trying on and off to get it for the last couple days, and just realized now that the entire FAQ section was recently replaced. 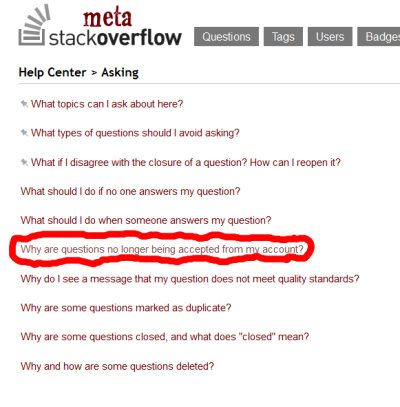 I find it odd that "What topics can I ask about here?" 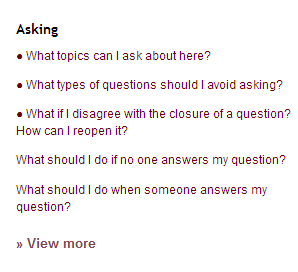 follows "What types of questions should I avoid asking? ", instead of preceding it, on the list at /helpcenter. It seems sensible to learn what one can ask before learning what one cannot. Update: This has been effected. The Help Center once rolled out will be site-specific, *.stackexchange.com/help-center. However, most of the Help Center will be common to the entire Stack Exchange Network and only a small sub-section will be site-dependent. The motivation behind going site-specific would probably have been the current site-specific FAQ pages, but if we are going with an entirely new concept of a Help Center, why not relook this as well? My suggestion : stackexchange.com/help-center, a centralized help center common to all of SE, with Community specific sections navigable through, say, a simple drop-down menu. Easier to keep up to date. Easier bug reporting and tracking. If we go for site-specific Help Centers, then bugs will first be reported to the site-specific metas', then would have to be pushed forward by a moderator to a Community Manager. Moreover, there is a high probability of the same bugs being reported across multiple sites. If centralized, all bugs would naturally find their way to MSO/MSE and would minimize redundancy. Also, no bugs would be lost across the Network metas. I voiced this above in a comment, repeating here. The Help Center could then have a single theme, and probably allow for even better and vibrant design than per site Centers. The only restriction would be to match with the SE.com theme. One more level of indirection to navigate to the per-site sections. Can we have a shortcut for on-topic to replace [faq]? Something like [on-topic]? I expected to find the /editing-help page somewhere in the Help Center. I couldn't find it via the menu system, so I used search. "Markdown" turned up no results. Searching "format" and "edit" turned up irrelevant results (from my perspective). Can the Markdown help page be added to the Help Center? Maybe it's a misinterpretation on my part, but I think the current flow is a little misleading: when clicking on take the tour at the main page in the helpcenter, we end up at the about page. This does not feel like a tour to me, it's more like a mission statement. It may be better if this page also included stuff like what to ask, how to ask, the voting process ... since this is likely what most new people actually want to know (and that's the audience of the help page, right?). Perhaps it may be useful to include 'next' links to move to said pages step by step? I realize that the main page contains links to how to ask-pages, but I think it may be useful to duplicate those links at the end of the current about-page. I'm guessing that there will be a link to this once it goes live site-wide, correct? The link should be prominent enough that users (especially the new ones) don't have to go hunting for it. Not the answer you're looking for? Browse other questions tagged discussion help-center help site-faq . Should one downvote answers to off-topic questions?